All secure online casinos offer players the option to fund their account via a bank transfer. It is the oldest payment method, and by far the safest. What’s more, deposits using bank transfers allow for the larger deposit limits than other payment methods. Bank transfers can be a slower option – but sometimes you may be able to pay a small fee to speed the process up. This is why we recommend wire transfers for the security conscious and high rollers. 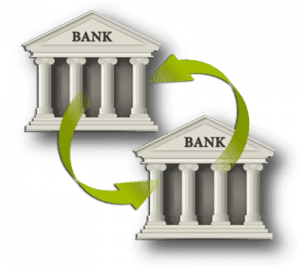 A bank transfer, which can also be known as a wire transfer, is one payment method which has been around long before the Internet. Before the web was introduced, people would go into their local branch to send money, but the Internet has made the whole process simpler – allowing us to send it electronically on our own personal devices. The old way is still available – but online banking is much more convenient. Instant bank transfers are just a speedier version of a wire transfer, usually incurring a fee for the funds to appear immediately or within a few hours. Online casinos offering bank transfers make it simple for players – just click the payment option in the cashier once logged in and confirm the transaction via your Internet banking client on their servers. It’s also possible to conduct the transfer manually by obtaining the web casino’s details and entering the information via your Internet banking site. Once you have confirmed the transaction it can take up to five working days for the funds to show up in your casino account but if it is processed faster you may see it appear before this time period. Instant bank transfers can see funds appear in your online casino account instantly or within a few hours. Can USA players deposit using bank transfers? Under US online gambling law, online casinos are prohibited from accepting real money payments from American residents, with US banks enforcing this law by blocking any payments made to online gambling providers. At offshore casino sites that continue to service the US market, deposits by direct bank transfer are not commonly offered, with vendors instead offering deposits via cryptocurrency methods like Bitcoin and Litecoin, Visa, Mastercard and cashier check. However, some USA-friendly casino sites (like Wild Casino) will accept payment via Bank Wire Transfer, with certain terms and conditions attached to facilitate this transaction. Find out more in our USA deposits guide. You need to ensure you have an online casino account and Internet banking before making a wire transfer. For the former, click one of the online casinos in the list above to register an account – this just takes a few minutes and your details are secure thanks to their advanced encryption technology. For Internet banking, simply head into your financial institution’s branch to opt in if you don’t already have it. Log in to your online casino account and head to the cashier. 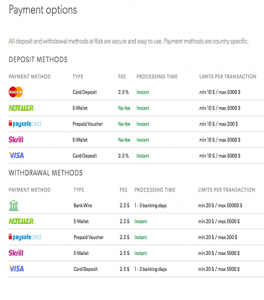 Here you will find a list of possible payment methods available, including bank transfer. Click on it to be taken to a page featuring a list of banks to pick from, or you will be given the casino’s details to enter manually. When entering the details manually be sure to include the reference number provided by the online casino or they can’t deposit the funds into your account. Confirm the transaction and allow for processing times – your funds will appear so you can get playing real money casino games. 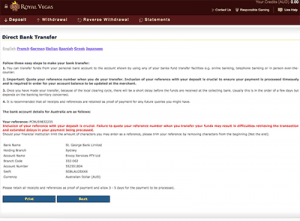 Withdrawals are generally available via bank transfer if the method is offered for deposits. Simply head to the cashier when you are ready to cash out and go to the withdrawal page. Withdrawals are similar to depositing funds, but the processing time can take a bit longer. All casinos listed in the table above are optimised for mobile devices – iPhones, iPads, Androids, Windows and other tablets and smartphones. You can play at these secure casinovenues just as you would on your desktop device and make deposits and withdrawals just as you would on a PC or laptop. However, only some sites allow for bank transfers via your portable mobile device. If your preferred online casino isn’t offered in the list of mobile casinos which do bank transfers, you may be able to contact the casino’s customer support team and perform the bank transfer manually via your Internet banking mobile app. If bank transfers still aren’t an option, consider the other commonly accepted casino deposit methods. When you are redirected to your internet banking page to confirm the transaction, you can feel somewhat hesitant to enter your account details. However, if you have chosen one or more of the sites above your details are secure. This is due to the SSL certification employed by these online casinos to protect sensitive data entered by players. This is confirmed by the padlock in the URL toolbar of your browser. Additionally, these sites are licensed by third party regulatory bodies confirming their security protocols and player protection policies are highly advanced. If you’re looking for a safe online casino to make real money deposits using a bank transfer, we recommend Raging Bull Casino as our top-rated casino site for players from United States. Not only is this casino site licensed and secure, it offers some great welcome bonuses for new players.